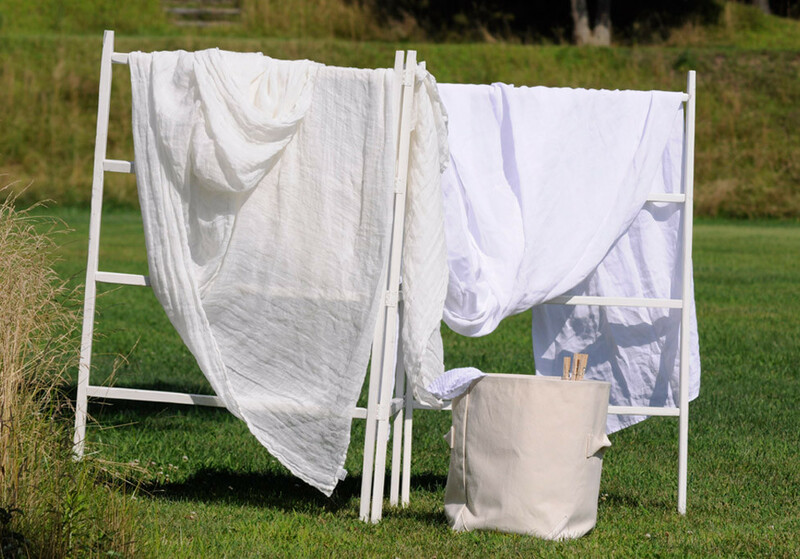 The changing season and the fall harvest brings with it, a new reason to gather. 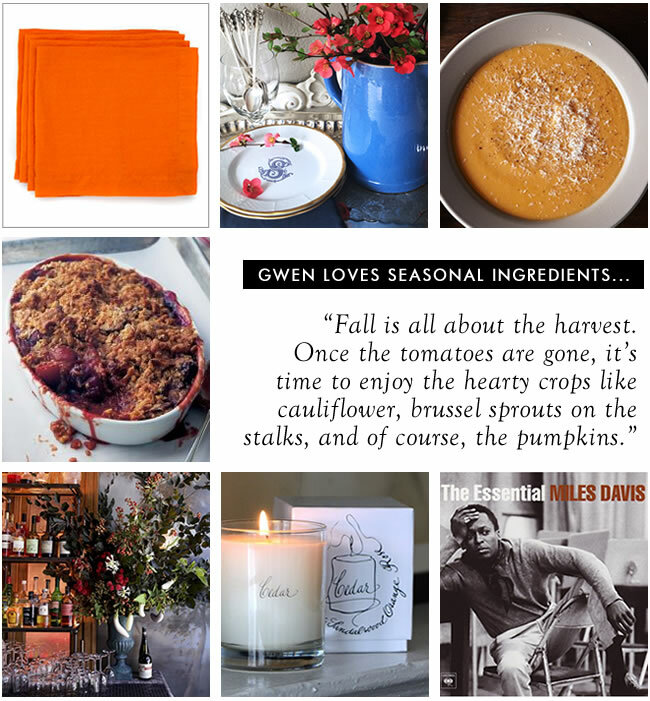 Gwen and Lindsey share their fall entertaining favorites, including the drinks, dishes, and décor that help them set the mood. These bright napkins add a pop of color to Gwen's table. The monogramming on these beautiful plates adds a personal touch. This is one of Gwen's favorite recipes, using delicious, seasonal ingredients. Gwen loves this recipe but uses Italian prunes, in-season for just a few weeks in September and October. She recommends cutting the sugar in half. These unique floral arrangements are a favorite for adding drama to the room. Gwen loves our Cedar Candle - a modern take on a woodsy scent with a base of cedar and sandalwood, orange and rose included. Jazz is a must and there's typically Miles Davis playing at some point in the evening. Apple picking season always inspires Lindsey to bake an apple pie. Lindsey loves this rustic centerpiece for its simplicity, with a subtle nod to the season. 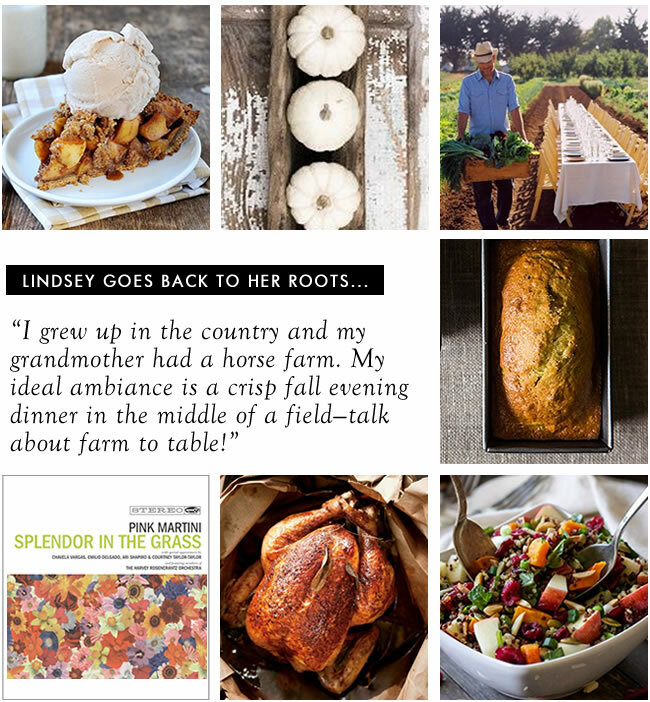 A true farm to table experience reflects Lindsey's ideal ambiance. Lindsey doesn't eat much bread, but she'll make an exception for zucchini bread. She uses fresh zucchini from her parents' garden. Quinoa is Lindsey's current obsession and the butternut squash, apples, dried cranberries, pepitas, and toasted almonds add plenty of fall flavor. Lindsey doesn't cook often, but loves to roast chicken in the fall. This recipe calls for steaming chicken in a paper bag to keep it tender. Pink Martini's jazzy vocals are a mainstay on Lindsey's entertaining playlist.